Identification: This aeolid has long cerata with four or more irregular, tuberculate swellings. Both the body and cerata are decorated with minute brown flecks and the sides of the body are marked with vertical gray bands. The rhinophores are flecked in white and brown with an irregular, subapical gray band. The cephalic tentacles have a broad, translucent-brown medial band and there are brick-red flecks on the notum behind the head. 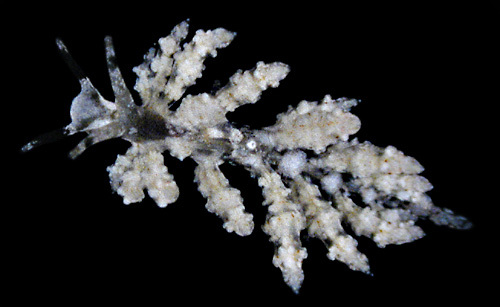 Natural history: The one Midway Eubranchus sp. #3 was found at about 9 m (30 ft) inside the lagoon. The single animal from French Frigate Shoals was collected in rubble. Distribution: French Frigate Shoals and Midway: also known from Japan; possibly in the eastern Pacific. Taxonomic notes: It was first recorded in Hawaii from Midway Atoll by Terry Gosliner and PF on May 29, 1993. Photo: PF: 3 mm: Midway Atoll; May 29, 1993.